View From The Boundary site news and a place for you to tell us your views and suggestions. 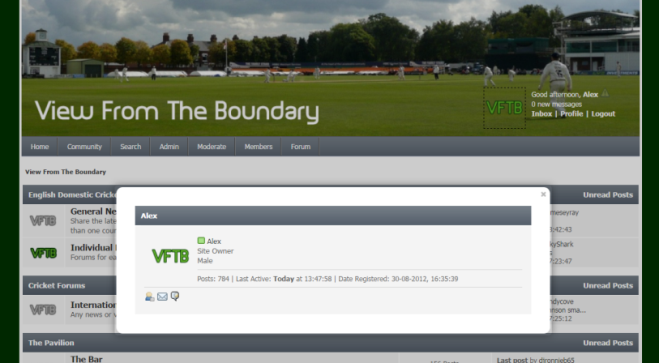 View From The Boundary is an innovative cricket forum which contains more features than most others, find out about our features by clicking the links below! Last edited by Alex on Mon Apr 13, 2015 11:48 am, edited 1 time in total. Find out when someone directly replies to you using the mentions system. You can see that when you use "@" and start to type a user’s name it suggests members names. Once the reply is posted the integration with the alerts system notifies you of a reply. There is also an option to receive a PM or an email when you get mentioned in a post. Last edited by Alex on Tue Mar 31, 2015 10:32 am, edited 1 time in total. Want to check out a members profile without leaving the page? Then with our profile popup modification you can do this! From here you can choose to look at a members posts, profile or send them a PM. Last edited by Alex on Tue Mar 31, 2015 10:34 am, edited 1 time in total. If you like a members post there is an option to "Say Thanks" for it. This is at the top right of every post except your own. When you click the triangle you can see your notifications. Want to have a chat about cricket? Speak to your fellow cricket fans in the shoutbox! You can find it at the bottom of the homepage. This will enable threads to stand out more on the forum and enables easier searching of the desired topic. I don't know whether this is just me, (or just my phone) but when a new page has just started (specifically the Word Association Game) I am unable to get to see the previous page. Eg. The first item was just posted to Page 12 by someone else. I could get to look at Page 10, but if I asked to go to page 11 I was taken to Page 12. Is this just specifically on mobile rather than on your computer? I rarely if ever look at the site on a computer so have had to wait until this morning. Seems to work fine on a computer. No problem at all. But going back to the phone, page 12 is now half full and I still can't access p.11, or even p.10. Not sure how far back it goes. I can though access p.4 (chosen at random). That seems to imply then that's it's a problem with our mobile theme, I will have a word with the author of the theme to see if it's a common problem.